Why do so many shots need to be given at one time? Can vaccines overload my child’s immune system? No parents like to see their child cry or get upset. Many parents become uncomfortable, concerned and stressed out when they learn about the number of vaccines recommended for children. It does seem like a lot of shots! Please be assured that it is very safe for your child to receive several different vaccines during one visit. Mild discomfort immediately following a vaccine is still better than your child getting a potentially life-threatening and vaccine-preventable disease. Scientific data show that this results in very few side effects. Studies also show that combination vaccines (which combine multiple vaccines into a single vaccine) pose no greater risk for side effects than vaccines given individually. These vaccines also are as effective in the combined form as they are when given separately. Please know, too, that vaccines do not overload a child’s immune system. Vaccines contain ingredients called antigens, which tell the body’s immune system to create those antibodies. Every day, a healthy child’s immune system successfully fights off thousands of antigens—the parts of germs that cause the body’s immune system to go to work. The antigens in vaccines come from the germs themselves, but the germs are weakened or killed so they cannot cause serious illness. Vaccines contain only a tiny fraction of the antigens that children encounter every day in their environment, even if they receive several vaccines on one day. Why are combination shots used? Combination vaccines take two or more vaccines that could be given individually and put them into one shot. Children get the same protection as they do from individual vaccines given separately—but with fewer shots. At a doctor’s visit, your child may only get two or three shots to protect him or her from five diseases, instead of five individual shots. Fewer shots may mean less pain for your child and less stress for you. Combination vaccines help parents, doctors, and nurses keep children up to date on vaccines. Combining vaccines into fewer shots may also mean that more children will get recommended vaccinations on time. And that means fewer delays in disease protection for children. Combination vaccines do not overload your child’s immune system. Vaccines contain ingredients called antigens, which tell the body’s immune system to create those antibodies. Every day, a healthy child’s immune system successfully fights off thousands of antigens—the parts of germs that cause the body’s immune system to go to work. Before a combination vaccine is approved for use, it goes through careful testing to make sure the combination vaccine is as safe and effective as each of the individual vaccines given separately. And, just as with individual vaccines, there are systems in place to watch for any rare reactions to combination vaccines that can be detected only after the vaccine is used widely. Learn more about each vaccine and what they protect against. Are all ingredients in vaccines safe? As a parent, it’s smart to question and be aware of anything that goes into your child’s body. Many parents naturally have questions about ingredients in vaccines, specifically when they hear words such as aluminum, formaldehyde, thimerosal, gelatin and antibiotics. However, parents can be reassured that ingredients in vaccines are minuscule, safe and necessary. Adjuvants: Adjuvants (like aluminum) help vaccines work better. They enhance the immune response, decreasing the quantity of vaccine needed to gain protective immunity, or lowering the number of doses required. By-products: Some products (like formaldehyde) are used during vaccine manufacturing to make sure viruses are inactivated and are removed except for a tiny trace. Stabilizers: Stabilizers (like gelatin) are added to vaccines to protect the active ingredients from breaking down during manufacture, transport and storage. Preservatives: Preservatives (like trace amounts of thimerosal) prevent bacterial or fungal contamination. Early in the 20th century, most vaccines were packaged in vials that contained multiple doses. Doctors and nurses would draw up a single dose and place the vaccine back in the refrigerator. Unfortunately, sometimes bacteria would inadvertently enter the vial and cause infections. Preservatives, originally added in the 1930s, solved this problem. Aluminum: Aluminum is present in our environment; the air we breathe, the water we drink and the food we eat all contain aluminum. The average person takes in an estimated 30 to 50 milligrams of aluminum every day, mainly from foods, drinking water, and medicines. Not all vaccines contain aluminum, but those that do typically contain about .125 milligrams to .625 milligrams per dose, or roughly 1 percent of the daily amount we all take in naturally. For example, in the first six months of life, babies receive about 4 milligrams of aluminum if they get all of the recommended vaccines. However, during this same period they will be exposed to about 10 milligrams of aluminum if they are breastfed, 40 milligrams if they are fed regular infant formula, and up to 120 milligrams if they are fed soy-based infant formula. Aluminum salts have been used as adjuvants in vaccines in the United States since the 1930s. Adjuvants enhance the immune response by allowing for lesser quantities of active ingredients and, in some cases, fewer doses. Some people wonder about the difference between aluminum injected in vaccines versus aluminum ingested in food. Typically, infants have between 1 and 5 nanograms (billionths of a gram) of aluminum in each milliliter of blood. Researchers have shown that after vaccines are injected, the quantity of aluminum detectable in an infant’s blood does not change and that about half of the aluminum from vaccines is eliminated from the body within one day. See more information on aluminum in vaccines. Formaldehyde: Vaccines contain antigens, or inactive versions of the viruses or bacteria they are protecting against. Formaldehyde is used during the manufacture of some vaccines to make sure these viruses or bacteria are dead. While most formaldehyde is purified away, small amounts remain. It is important to realize that formaldehyde is also a natural by-product of processes in our bodies, so it is commonly found in the bloodstream. The quantity of formaldehyde found in our blood is 10 times greater than that found in any vaccine. Thimerosal: Thimerosal, a mercury-containing preservative, is no longer used as a preservative in any childhood vaccine except for the influenza vaccine, and some versions of the influenza vaccine are thimerosal free. Mercury is a naturally occurring element found in the earth’s crust, air, soil and water. As a result, we are all exposed to mercury. Thimerosal is also found in trace amounts in some multi-dose preparations of the influenza vaccines as a preservative to help prevent the vaccine from becoming contaminated with bacteria, which could cause infection. Today, breastfed infants are exposed to 15 times more mercury in breast milk than is contained in the influenza vaccine. More information on thimerosal is available from the Centers for Disease Control and Prevention and the Children’s Hospital of Philadelphia. Other ingredients: The amount of good and bad information online about vaccines can be overwhelming and confusing, but you can’t believe everything you read about ingredients in vaccines. For example, no vaccine contains, or has ever contained, antifreeze. It’s important to look to the most trusted physician, research, and public health organizations in the world for answers. The Centers for Disease Control and Prevention has compiled into a table the ingredient list for most vaccines. While the table may be helpful for people concerned about particular allergies or ingredients, it is important to realize that the table does not indicate quantities in each vaccine. In most cases, the quantities are so small that they do not cause allergic reactions or symptoms of toxicity. Talk to your child’s doctor about any questions or concerns you have about vaccine ingredients. Do ingredients in vaccines cause allergic reactions? It’s best to talk to your child’s health care provider about your child’s allergies and any concerns you may have regarding allergies and vaccines. Some ingredients in vaccines can cause allergic reactions. In addition to gelatin, other ingredients in vaccines such as egg proteins, antibiotics and yeast proteins might cause an allergic reaction. Latex used in vaccine packaging is also a concern related to allergies. Egg proteins: Because the influenza and yellow fever vaccines are grown in eggs, the final products may contain egg proteins. Advances in vaccine technology have resulted in significantly lower quantities of egg proteins in the influenza vaccine; therefore, people with egg allergies can now get influenza vaccine. However, it is recommended that children who are severely allergic to eggs remain in the office for 15 minutes after getting the influenza vaccine in case of any reaction. Antibiotics: Antibiotics are used to prevent bacterial contamination during production of some vaccines. However, the types of antibiotics used in vaccines are not those to which people are usually allergic. Yeast proteins: A couple of viral vaccines are made in yeast cells; these include hepatitis B vaccine and the human papillomavirus vaccine. Although the vaccine is purified away from the yeast cells, about 1 to 5 millionths of a gram remain in the final product. The good news is that people who are allergic to bread or bread products are not allergic to yeast, so the risk of allergy from yeast is not likely. Latex packaging: A small number of vaccines are packaged with materials that include latex. While it is rare that patients have a reaction to latex in vaccine packaging, people with latex allergies should consult with their allergy doctor before getting any vaccines packaged in this way. Corn and peanut oils: Vaccines do not contain either corn or peanut oils. No. One of the most frequent concerns expressed by some parents is that certain vaccines might cause autism. Please know there is absolutely no credible medical or scientific evidence to support any link between vaccines and autism. In fact, numerous credible medical, science-based studies have shown that there is no link between receiving vaccines and developing autism. You can read more about these studies on the Centers for Disease Control and Prevention website, the Children’s Hospital of Philadelphia website and the Autism Science Foundation website. In 1998, a British researcher named Andrew Wakefield raised the notion that the MMR vaccine might cause autism. In the medical journal The Lancet, he reported the stories of eight children who he claimed developed autism and intestinal problems soon after receiving the MMR vaccine. It is important to know that the Wakefield study was later retracted for scientific misconduct, as his studies were exposed as fraudulent and his data misrepresented.However, to test Wakefield’s discredited claims, researchers performed a series of studies comparing hundreds of thousands of children who had received the MMR vaccine with hundreds of thousands who had never received the vaccine. They found that the risk of autism was the same in both groups. The MMR vaccine, in fact, did not cause autism. Some parents wary of the safety of the MMR vaccine stopped getting their children immunized. As immunization rates dropped, outbreaks of measles and mumps led to hospitalizations and deaths that could have been prevented. Read the scientific studies on the Autism Science foundation website. Several studies have shown that thimerosal in vaccines does not cause autism. Thimerosal is a mercury-containing preservative that was used in vaccines to prevent contamination. Thimerosal is no longer used as a preservative in any childhood vaccine except for the influenza vaccine. Attention by the news media has caused some parents to fear that thimerosal contained in vaccines might have harmed their children. Addressing these concerns, scientists performed several studies to determine whether thimerosal causes autism. Hundreds of thousands of children who received thimerosal-containing vaccines were compared to hundreds of thousands of children who received the same vaccines free of thimerosal. The results were clear: The risk of autism was the same in both groups; thimerosal in vaccines did not cause autism. Read the scientific studies on the Autism Science foundation website. Before they are licensed, new vaccines are tested alone or in combination with existing vaccines. 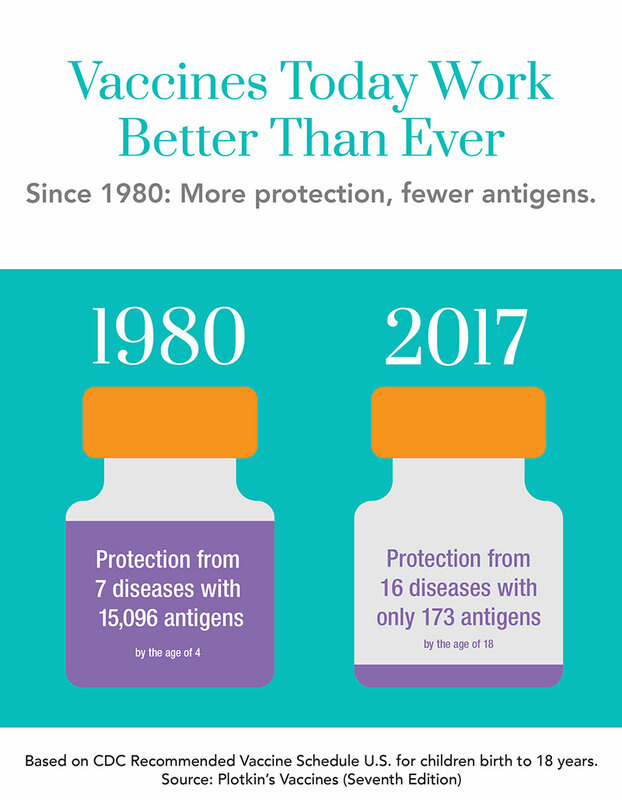 These studies determine whether new vaccines change the safety and effectiveness of existing vaccines and whether existing vaccines affect the new vaccine. These studies are performed every time a new vaccine is added to the existing vaccination schedule. Every day, a healthy child’s immune system successfully fights off thousands of antigens—the parts of germs that cause the body’s immune system to go to work. Vaccines contain only a tiny fraction of the antigens that babies encounter every day in their environment, even if they receive several vaccines on one day. Here is a list of 4 of the more than 20 reputable studies that have found no relationship between MMR vaccine and autism. These studies illustrate the variety of methods that have been used to investigate whether MMR vaccine is linked to autism. Immunization Safety Review: Vaccines and Autism. by Mady Hornig et al. PLoS ONE. September 2008.
by Frank DeStefano et al. Pediatrics. February 2004.
by Kreesten Meldgaard Madsen et al. New England Journal of Medicine. November 7, 2002. I breastfeed, does that offer enough immunity? Babies may get some temporary immunity (protection) from mom during the last few weeks of pregnancy—but only for the diseases to which mom is immune. Breastfeeding may also protect your baby temporarily from minor infections, such as colds. But these antibodies do not last long, leaving your baby vulnerable to disease. Vaccination is one of the best things you can do to protect you and your baby against serious diseases. You probably know that when you are pregnant, you share everything with your baby. That means when you get vaccines, you aren’t just protecting yourself—you are giving your baby some early protection too. You should get a flu shot and whooping cough vaccine (also called Tdap) during each pregnancy to help protect yourself and your baby. Your ob-gyn or midwife may recommend you receive some vaccines right after giving birth. Postpartum vaccination will help protect you from getting sick and you will pass some antibodies to your baby through your breastmilk. Vaccination after pregnancy is especially important if you did not receive certain vaccines before or during your pregnancy. It is safe for you to receive vaccines right after giving birth, even while you are breastfeeding. Be sure to discuss each vaccine with your health care professional before getting vaccinated. My child is sick right now. Is it okay for my child to still get shots? A mild illness is usually not a reason to delay vaccinations. Your doctor can help you decide which vaccines your child can still receive safely. It’s tempting to cancel or reschedule a doctor’s appointment for vaccines when your child has the sniffles, an upset stomach, or a mild fever. But doctors at leading health organizations, like the Centers for Disease Control and Prevention, the American Academy of Family Physicians, and the American Academy of Pediatrics say mild illness usually is not a reason to put off vaccinations. There is no health benefit to waiting to vaccinate your child if he or she has a mild illness. It’s important that children get their vaccines on time—even if they don’t feel well—so they’re protected against serious diseases. It is not recommended to give your child pain or fever reducers before vaccination, but it is okay to give a non-aspirin pain reliever after the appointment as long as your doctor approves. Giving these medications before vaccination can interfere with the immune response. Vaccines do not make a mild illness worse. A child’s immune system can respond to thousands of antigens every day. Antigens are things like bacteria and viruses that cause your child’s body to produce antibodies against them. Vaccines have only a tiny fraction of the antigens that children encounter on a daily basis. So, the immune system can handle getting vaccines to build immunity to diseases and fight minor illnesses at the same time. Vaccines do not make symptoms of illness worse—though they may cause mild side effects, like a mild fever or soreness or swelling where the shot was given. To help with discomfort from these side effects, put a cool, wet washcloth on the sore area or ask your child’s doctor about using pain- or fever-reducing medicine. Mild illness also does not affect how well the body responds to a vaccine. Vaccines build up protection in a child who is mildly ill as well as they do when the child is healthy. Reactions to a vaccine, such as fever, could make it harder to diagnose and treat a serious illness. And it’s possible that signs of the illness could be mistaken for a reaction to the vaccine. If your child has a serious illness or medical condition, talk to your child’s health care provider. Why are there so many side effects listed on vaccine package inserts? The U.S. Food and Drug Administration sets specific guidelines on what must be included in a vaccine package insert. Specifically, any side effect that occurred after receiving the vaccine during the clinical trials must be reported, even if that side effect was reported as occurring at a similar rate among people who received the placebo. Data collected during clinical trials are given to the Centers for Disease Control and Prevention (CDC) to help them make vaccine recommendations to healthcare professionals. The CDC looks specifically for side effects that happen more often in people who received the vaccine than those who received the placebo. Only side effects that happen more often in the group that received the vaccine, in comparison to the group that received the placebo, are listed on the CDC website as possible side effects. This is why the package insert and the CDC list may have different side effects for vaccines. The FDA requires all side effects to be reported on the package insert, even if they happen as frequently among the placebo group during clinical trials. Everyone else’s children are vaccinated. Why do I need to vaccinate my child?